Easy Tips and Tricks for Sewing Minky! I absolutely love Minky. It's versatile and can be used to make blankets, home accessories, and even clothing. It has a very luxurious hand, drapes beautifully, and has a lovely sheen. These defining characteristics are why Minky is so difficult to sew. Thankfully, with the proper tools and a few tricks, sewing Minky can be an enjoyable experience. When buying Minky, pay close attention to the care instructions written on the bolt. Generally, you can machine wash in cold water and machine dry on low. However, some Minky is, "Dry Clean Only". If you must iron, use low heat and a pressing cloth. I advise staying away from "bargain brand" Minky because, although it may look nice on the bolt, with the first wash, it will lose its silky texture and vibrant shine. Considering the amount of effort you'll put into sewing Minky, you might as well invest in a quality brand. When you go to buy Minky you'll need to purchase extra yardage. It has a distinctive nap, meaning patterns must be cut according to the "nap layout", which uses more fabric. Cutting Minky produces a lot of fuzz bunnies; be prepared for a mess. Also, I recommend only cutting one layer at a time. If you intend to cut two layers at a time, place a sheet of tissue paper between the layers. When it's time to sew, you'll need a Walking Foot, a 90/14 Ball Point Needle, Polyester Thread, and a ton of long pins or Wonder Clips. For the best seam, increase your stitch length to 3.0 and decrease your stitch tension. You can use a straight stitch, a zig-zag stitch, or a stretch stitch. For really tricky seams, hand-baste first. You'll also have nice results if you stay-stitch curves before sewing the permanent stitches. If your seams look "wavy", try reducing your pressure gauge. Minky doesn't fray, so you don't have to finish raw edges. However, raw edges do tend to "curl". If the curl is bothering you, finish the edges with a zig-zag stitch, an overcast stitch, or even an overlock stitch. 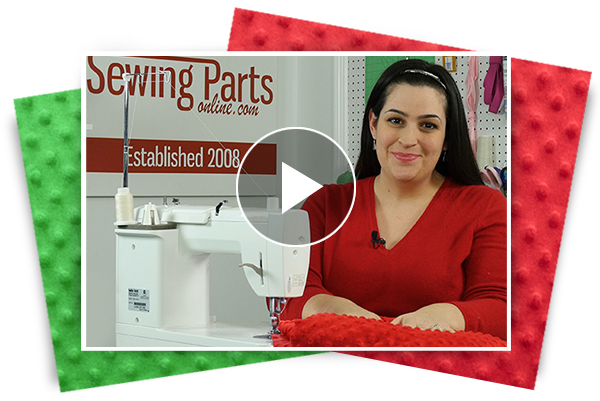 If you use a serger, you'll have to deep clean your machine once your project is finished. Just like Fleece, all closures and high-stress areas will need to be stabilized. So if you are adding buttons or zippers, use a light-weight stabilizer. Reinforce those crotch areas with a second seam and add a strip of ribbon or rick-rack to the shoulder seams. When embroidering, use a sticky-back stabilizer on the bottom so as to "float" the Minky instead of hooping it. Always use a clear, water-soluble stabilizer on top. I hope you find this information to be helpful. Don't forget to take advantage of our huge fabric sale (15% off all fabric through December). Mystery Grab Bags are also available through Decemeber, but only while supplies last. If you have any comments or questions, be sure to reach out to us. We're here to help and we love to chat! Copyright © 2016 Sewing Parts Online, All rights reserved. You gave us permission to update you with sewing news, tutorials, and products because you've had a positive experience with us in the past. We value your time and sincerely appreciate your subscription.